Walkerella Westwood 1883. Type species: Walkerella temeraria Westwood 1883. 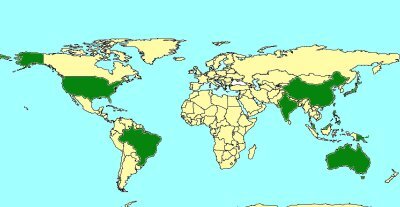 Australia, Brazil, Cayman Islands, China, India, Japan, Malaysia, Papua New Guinea, Philippines, Taiwan, U.S.A.
Gall fomers of ovules in Ficus species. Beardsley, J.W. 1998. Chalcid wasps (Hymenoptera: Chalcidoidea) associated with fruit of Ficus microcarpa in Hawai’i. Proceedings of the Hawaiian Entomological Society, 33, 19–34. Bouček, Z. 1988. Australian Chalcidoidea (Hymenoptera): A Biosystematic Revision of Genera and Fourteen Families, with a Reclassification of Species. CAB International Institute of Entomology, Wallingford, UK., 832 pp. Bouček, Z. 1993. 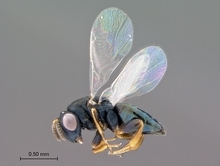 The genera of chalcidoid wasps from Ficus fruit in the New World. Journal of Natural History 27: 173-217.
van Noort, S., Wang, R. & Compton, S.G. 2013. Fig wasps (Hymenoptera; Chalcidoidea: Agaonidae, Pteromalidae) associated with Asian fig trees (Ficus, Moraceae) in Southern Africa: Asian followers and African colonists. African Invertebrates 54: 381–400. Westwood, J.O. 1883. Further descriptions of insects infesting figs. Transactions of the Entomological Society of London 1883: 29-47, plts iv-x.